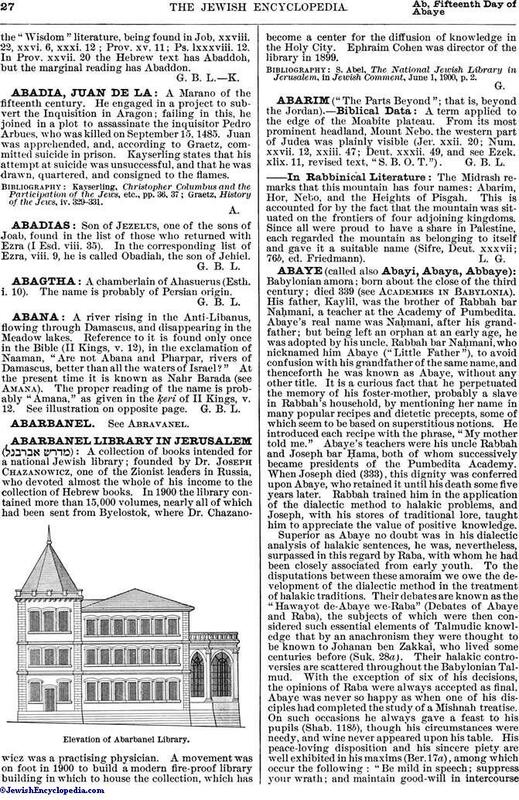 ABARIM ("The Parts Beyond"; that is, beyond the Jordan). A term applied to the edge of the Moabite plateau. From its most prominent headland, Mount Nebo, the western part of Judea was plainly visible (Jer. xxii. 20; Num. xxvii. 12, xxiii. 47; Deut. xxxii. 49, and see Ezek. xlix. 11, revised text, "S. B. O. T."). The Midrash remarks that this mountain has four names: Abarim, Hor, Nebo, and the Heights of Pisgah. This is accounted for by the fact that the mountain was situated on the frontiers of four adjoining kingdoms. Since all were proud to have a share in Palestine, each regarded the mountain as belonging to itself and gave it a suitable name (Sifre, Deut. xxxvii; 76b, ed. Friedmann).